We have lived in the heart of Seattle, on Capitol Hill, for more than 35 years. This is the story of how we landed in an intentional community. We love the density, diversity, and walkability of our neighborhood. The idea of intentional community always interested us. When we explored cohousing in the early ’90s everything seemed to be out in the country. Living in a rural setting seemed isolating to us. After 20 years in a large house where we spawned two all-volunteer community groups, but had no children and didn’t know our neighbors despite efforts, we decided to downsize to a new, nearby 150-unit condo that was marketed as community-living. For the first few years it was “cohousing lite” because we did many things to foster community. But when community isn’t “intentional” it really is not sustainable. We soon felt isolated again because no one shared our vision for community. In 2010 we heard about a forming cohousing community with property located in our neighborhood. And that is where our story begins. We began with regularly scheduled introductory meetings promoted through the neighborhood blog. We joined the group after that first meeting and got to work by publishing a website with our vision and values to help attract folks who would be a possible fit. During this process we “kissed a lot of frogs.” Many folks were excited about cohousing and/or our project, but for an assortment of reasons it didn’t work for them. Barriers included timing, size of units, cost, and lack of parking. Of course in some cases it just wasn’t a good fit. It was a “self-selecting” process with no application form, background checks, or community approval. Potential candidates simply came to more and more events. And it worked. After several years we had all nine of our families committed and participating. Everyone involved was drawn to living in community AND specifically to this urban Capitol Hill location. Our intention to build our skills as a community was an integral part of our success. Early on we had several all-day, professionally facilitated workshops which included creating our vision and values, learning to make decisions by consensus, conflict resolution, communication styles, and power dynamics. From the beginning we had monthly business meetings with potlucks, and sometime before construction started we added biweekly Supper Club. We organized social events such as roller-skating, going to baseball games, bowling, game nights, pumpkin carving, and post-Thanksgiving potlucks to create connections and a sense of community. There were also numerous team meetings to devise plans for our common meals, integrate the kids into the community, draft our legal structure and operating agreements, and most importantly design and develop the building and how it would all get financed and maintained. Property in the city is at a premium. Generally developers buy it and then sell condos to make back their money with a hefty profit. Of course since we were not building to sell at a profit we had to factor in the higher property costs. The site itself is one city lot, about 4500 sq. ft.—40 ft. wide and 113 ft. deep. Original plans explored buying adjacent lots, but we were unable to make that happen. To maximize floor area we chose to build lot-line to lot-line, which meant no windows on the north and south. To include windows would have meant a 3 ft. setback, which would mean lost living space and a higher rent per square foot. We were required by the city to have commercial space on the ground floor and the site topography allowed for a maximum height of five stories. This limited the number of units we could create in our space. Combined with the limitations of a single lot, we ended up with nine apartments ranging from 810 sq. ft. to 1300 sq. ft. plus 900 sq. ft. for our Common House. Fortunately parking spaces were not required because our location is in an “urban hub” with a myriad of transportation options including bus, light rail, bike and car shares. This saved us hundreds of thousands of dollars for the cost of underground parking. We’re in walking distance of hospitals, library, groceries, parks, farmers’ market, restaurants, entertainment venues, and colleges. The rule of thumb we’d heard going in is to expect the process to take about five years. When we started in 2010 we thought that having a site and cohousing-savvy architects already in place would save us time. Our project actually took longer. We lost a full year due to the lawyers who couldn’t comprehend that the founders didn’t want to make a big return on their original investment to buy the property or that the LLC we formed wasn’t motivated by the capitalistic idea to maximize profits.. That delay put us on the back side of a construction boom in Seattle, which meant we had difficulty finding contractors and subcontractors within our budget for the project. In 2014, as we neared closing on our construction loan, our developer realized we had a $700K shortfall in the equity our group was bringing to the table. She helped us brainstorm a way to raise the money, a seemingly impossible task. Within a month we raised all the funds through low-interest loans from friends and family—including those who didn’t know us personally but lived in cohousing and wanted to see us succeed. Our developer mistakenly believed that once the building was completed we could get a large enough mortgage to pay off these loans. Sadly, the new loan amount came in lower than expected. The final amount was based on the LLC’s net income and since we want to keep our rent low, our loan was correspondingly lower. So it will take longer than we planned to retire our debt. Why didn’t we just build condos? Due to the 2009 crash, no one was lending for new condo construction and we learned that the national Coop Bank was not interested in financing any new cohousing projects. We developed our own model. We formed an LLC which owns the building, which is how many apartment buildings are owned. Since we are all members of the LLC, we essentially rent from ourselves. Being both landlords and tenants was unconventional enough to make the bank underwriters nervous at first. But actually it offers advantages to the community. For one thing it allowed younger families and those without liquid assets to remain in the community—we didn’t require each family to have a large down payment for a home. It also means when families downsize, they can change the unit they occupy without changing title and without the associated costs of selling and buying into another more expensive one which would be a typical condo scenario. We started with a big vision and high values around sustainability and construction quality. But once again monetary realities created challenges and compromises. With all the construction in town, prices skyrocketed for everything from labor to materials. Along the way we had to scale back some of our green building plans. We still retained many sustainable features which also enhanced our community interaction such as taller windows, higher ceilings, and wide walkways. One setback was when our electrical contractor went belly-up mid-project. The General Contractor had to find a replacement. Then the new contractor had to review and fix a lot of what was thought to have been already completed. Construction delays ultimately ate up any budget that might’ve provided some of the comforts of home such as rooftop furniture and Common House furnishings. One way we have addressed it is with occasional anonymous funding sourced within our community for the things removed from the budget. We decided early on that meals would be the glue of our community. Therefore our Common House kitchen and dining areas were designed to accommodate our whole community and guests, including having a pantry, guest room, and laundry. We consider our food program a huge success. In fact, a cohousing visitor from Australia declared it was “brilliant!” It provides a variety of tasty meals. It frees up busy parents and professionals from almost half their evening meal preparation. This simple system where everyone participates requires no bookkeeping. The head cook decides the menu, buys the food, then leads the prep with two assistants. The cook spends what they want, recognizing they will enjoy 17 meals free over the next six weeks. Everyone’s special dietary needs are accommodated along with a commitment to being nutritious and delicious. We’ve had fun with figuring out interesting menus—some simple and others much more elaborate with specialty cocktails and desserts. Plus, guests are always welcomed. Remember it’s about what is best for the community. With these points guiding us, we consistently come out the other side with a better solution than any one of us started with. The city requires a certain amount of greenspace in every urban project. Rather than grass, trees, or flowers, we opted to create a working farm to support our goals of sustainability and community partnerships. Since most of us have full-time jobs and/or children, we partnered with Seattle Urban Farm Company (SUFCo) to design, construct, and operate our farm. 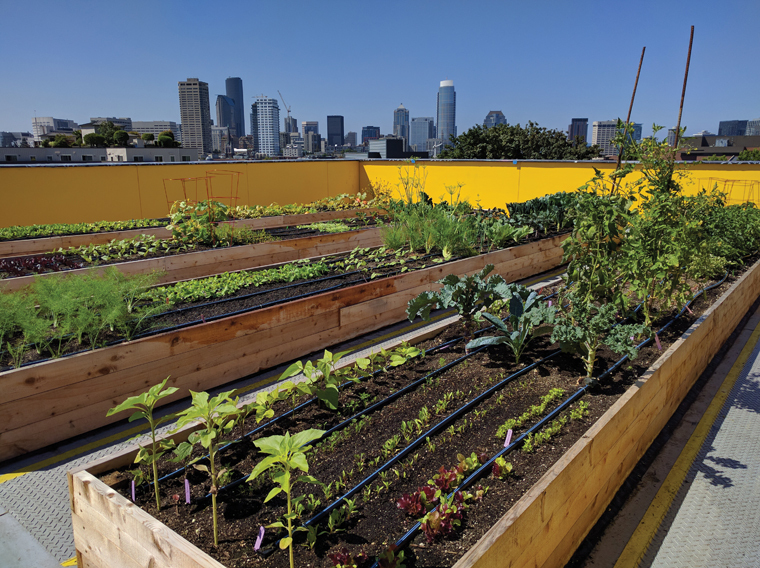 We held a web-based “BarnRaiser” to raise the donations to pay for the build-out of the raised planters, the additional structural system to support the roof, and the irrigation system. Then we partnered with a nearby white-tablecloth restaurant that is paying the on-going maintenance costs directly to SUFCo. In return they get a large percentage of the harvest for their upscale “farm-to-table” menu. The community also gets some of the fresh produce for community meals. And best of all, our kids learn where their food comes from, how it grows, and can get their hands dirty. We have now lived in Capitol Hill Urban Cohousing for more than a year. We love living in community with adults and children, sharing meals three times a week, being available to each other’s needs including walking children to school, pet sitting, repairs, outings, etc. Recently we all attended the wedding celebration of one of our resident couples. We clearly have built not only an apartment building but a true sense of community. Sheila Hoffman and Spencer Beard have had “founder’s energy” for decades, having founded and led the local chapter of EarthSave International in the ’90s as well as founding the Evergreen Tandem Club in 2001 and of course being part of founding Capitol Hill Urban Cohousing on Seattle’s Capitol Hill (capitolhillurbancohousing.org). Sheila develops WordPress websites and Spencer is a retired elementary school teacher. At 68 and 65 respectively, they are the elders in CHUC. ← LAST CHANCE for these Sale Items!